Minette Vinius is a Nord child who lives in Solitude in The Winking Skeever. 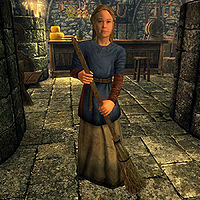 She is the daughter of the inn's owner Corpulus Vinius and the sister of Sorex Vinius. Minette wears blue colored child's clothes and a pair of shoes, and is equipped with a simple iron dagger. She carries a key to her father's inn, a selection of food and toys, and a small amount of gold. When approached by the player in The Winking Skeever, she demonstrates an open and somewhat businesslike attitude, asking: "What's your name? Are you visiting? What do you do?" If her father shares his thoughts about retirement with Sorex, Minette jumps right in and suggests she could run the inn, since Corpulus calls her "greg-gare-ree-yus", which according to him means "smart". She spends her days playing outside with her friends Svari and Kayd. Even though her father and brother are Imperials, she is a Nord, and she has a Breton name. However, her father's cousin is also a Nord. If you adopt her after her father's death then she may mention that he used to call her "greg-gare-ree-yus" just like himself and say that she misses him. She may claim to be orphaned and have the dialogue prompting the player to adopt her, even when her father is still alive. This page was last modified on 4 November 2017, at 07:02.